This is another garage sale find by my good friend Larry – an 8mm cine camera made by US manufacturer Keystone of Boston Mass. This was basic consumer model produced during WWII, and would have been a popular choice for US servicemen and their families. The camera is very pocketable, as it weighs only 0,750 kg and measures 42x160x95mm. Like other cine cameras of this era, it’s an all metal construction, with a crackle finish dark green/brown paint job. The shape reminds me of a sardine can! The camera comes with a Wollensak Velostigmat 1:2.5 13 mm Lens, which isn’t the greatest for IQ, but actually was said to produce reasonable results considering the price and small size of the unit. The instructions for exposure are on a handy plate, right there on the front of the camera – so it takes just a second to review the lighting conditions and decide on the right aperture setting. 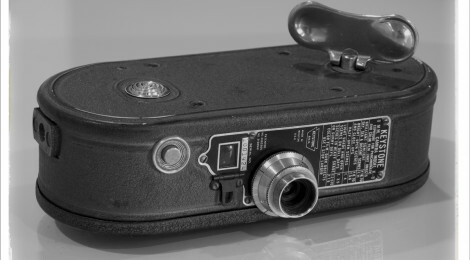 The shutter release in just below the tiny viewfinder. On the rear of the camera, we find control for film speed – the standard 16 fps, a low speed 12 fps, and a slow-motion 48 fps. The eyepiece is just below that, and is somewhat small – you can basically work out if you have the subject in frame, but that’s about it. Opening the sardine can, we find a standard 8mm mechanism, with a nicely chromed film gate. Film loading instructions were printed on the inside of the lid. As with all standard 8mm cameras, you loaded the film in a darkened place to avoid too much light exposure, and then had to change the film over, and run it the other way, after the first 25′ pass. The exposed film (Actually 16mm wide) would be split down the middle at the lab, giving you a final 50′ reel of Standard 8mm film. Power was provided via a clockwork motor – with a chromed ‘Mickey Mouse Ears’ winder key. The footage counter is top left, so you have some idea of how much film you have remaining. Unfortunately, being a cheaper model, the motor had a habit of slowing down as the spring wound down, so the film speed would change, making the action appear to speed up! The viewfinder appears to have a swing-in mask for shooting telephoto – so I assume the original camera came with a screw-on telephoto adapter lens – which is missing from this one. Amazingly, this camera still runs when you wind it up – the mechanism sounds a little crunchy, but my guess would be that it would still be able to shoot a roll of 8mm film, just as it did during WWII. Keystone kept producing cameras all the way through to 1991, when they eventually folded – but it’s amazing to read that their 16mm cameras from the 40s are still in use today.